A view of a very central point of Rome. 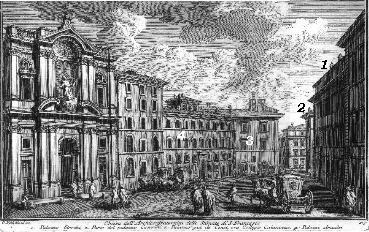 The viewer is coming from the Pantheon and is going towards il Gesù. The view is taken from the green dot in the 1748 map below. 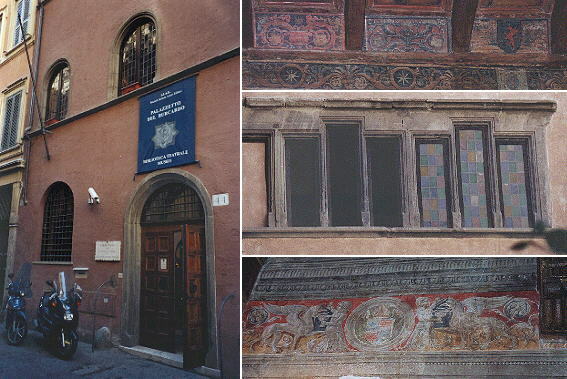 In the description below the plate Vasi made reference to: 1) Palazzo Strozzi; 2) Palazzo Cesarini; 3) Collegio Calasanzio, once Palazzo Cenci; 4) Palazzo Amadei. The map shows also 5) SS. 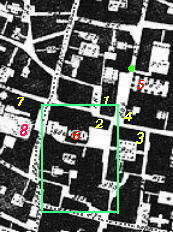 Stimmate di S. Francesco; 6) S. Nicola de' Cesarini; 7) Casa del Burcardo; 8) Teatro Argentina and in green Area Sacra. The dotted line in the small map delineates the border between Rione Sant'Eustachio (left) and Rione Pigna (right). 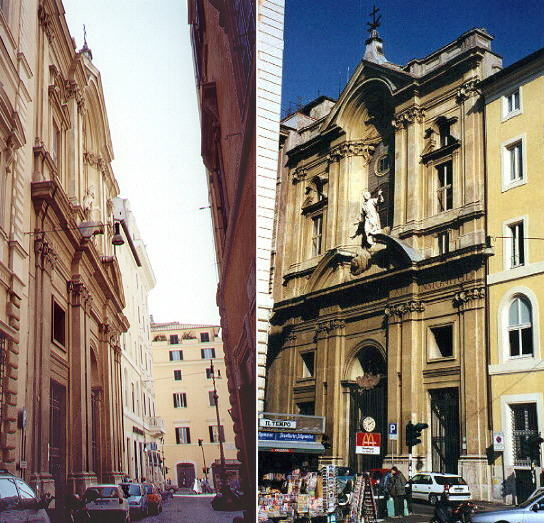 The view is changed due to the enlargement in the 1880s of Vicolo de' Cesarini a narrow street (on the left) leading to il Gesù. The resulting large street is called Corso Vittorio Emanuele. Palazzo Amadei on the left was pulled down and replaced by a much smaller building. Palazzo Strozzi was shortened too. In the 1920s it was the turn of Palazzo Cesarini (and in part of Collegio Calasanzio) to be pulled down: the discovery in its foundations of the ruins of very ancient Roman temples led to the creation of an archaeological site (Area Sacra dell'Argentina). Because of the narrowness of the street the church can be seen much better from the other side. It was erected in 1714-1721 by Giovan Battista Contini and Antonio Canevari. 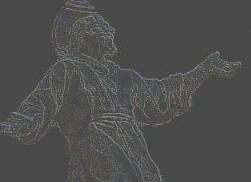 St Francis is represented in the act of receiving the stigmata (statue by Bernardino Cametti). The church is also known as Chiesa dei Quaranta Martiri di Sebaste and this is the name used by Vasi in his map. The Strozzi were a family of Florentine bankers whose palace in Florence is a masterpiece of Early Renaissance. The Roman branch of the family bought this palace opposite the church in 1649 from the Olgiati for whom the building had been designed by Carlo Maderno in the early XVIIth century. The picture shows the remaining original part of the building and a detail of the portal. 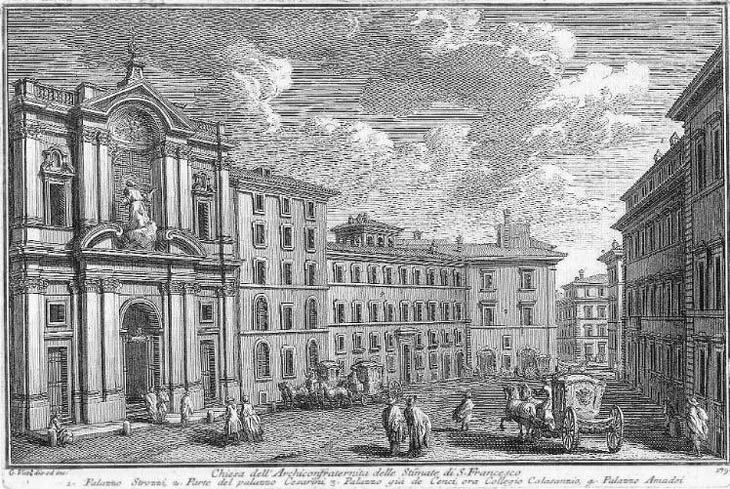 Collegio Calasanzio or delle Scuole Pie was a brand new building when Vasi made his etching as it had been erected in 1746. Josè de Calasanz was a Spanish priest who founded in 1597 in Rome the first school which did not require an admission fee. The members of his order are usually known as Scolopi, after Scuole Pie (pious schools). The architect Tommaso De Marchis made only one concession to the decoration of the building in the elaborate capitals and in the cornice. The elegant madonnella is a copy of Raphael's Madonna della Seggiola. The Cesarini were a very prominent family for many centuries. The palace and the family church (S. Nicola dei Cesarini), built on the site of very old temples was sacrificed in 1929 to the excavation of the area. The objective was to enlarge the street linking Corso Vittorio Emanuele and Via Arenula. It was known that S. Nicola dei Cesarini had been built on a Roman temple and that its cloister made use of the columns of a second temple, but the excavations led to the discovery of four temples in a sacred precinct. The church was also called S. Nicola de Calcarariis, after the medieval workshops where for many centuries ancient marbles were calcined and turned into mortar. The ruins of the temple upon which the church was built date back to the IIIrd century B.C. The columns were made with tufa coated with plaster. The travertine columns on the right are due to a later period. There are traces of ancient frescoes on the walls of the church apses. The excavations, which also caused the pulling down of Palazzo Sonnino Colonna, led to the discovery of three other temples, the finest one being a circular temple with tufa columns crowned by travertine capitals. The Romans took care also of practical needs and the excavations brought to light a large forica (public latrine) (top right in the image). The site of the Roman temples hosts a very large colony of cats: other cats live in Colosseo and in Piramide di Caio Cestio. A small relief showing Atlas supporting the celestial vault is walled in a modern building at the southern side of the square. In 1731 the Cesarini built a very large theatre on a site next to their palace. The building was designed by Girolamo Theodoli but the façade is an 1826 addition which reflects the impact of Neoclassicism on traditional baroque subjects (you may wish to compare the two personifications of Fame on the top of Teatro Argentina with those of Fontana di Trevi). It is now a drama theatre, but in the past it was mainly used for operas. On February 20, 1816 the premiere of Almaviva by Gioacchino Rossini was a sensational fiasco, but at the second performance the public had a different opinion and Almaviva (later on called Il Barbiere di Siviglia) became one of the best known Italian operas. 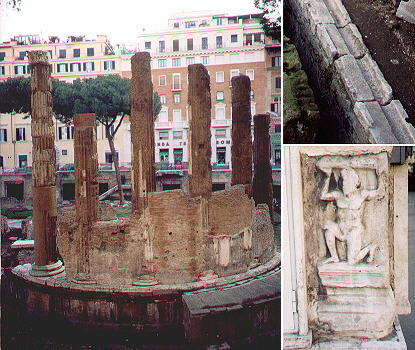 The theatre was commonly called Teatro Argentina and the whole area is similarly named (Largo Argentina, Torre Argentina). According to Vasi, this is due to the fact that a Cardinal Cesarini was for a while the bishop of Strasbourg (France), which in Latin was called Argentorate. 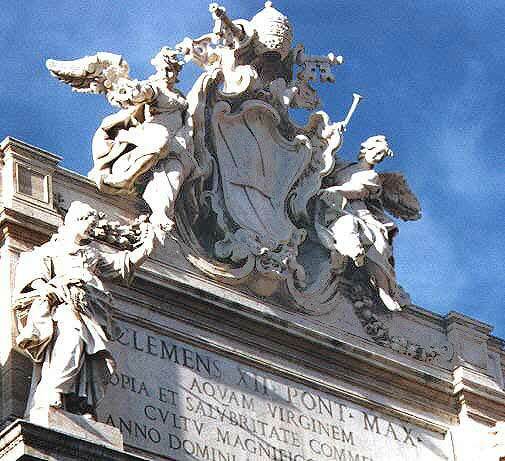 When he returned to Rome he put over many windows the inscription "ARGENTINA" and this word in the end prevailed. As a matter of fact the bishop was not a member of the Cesarini family. His name was Johannes Burckardt (italianized in Burcardo) and he arrived in Rome in 1479. He built a little palace where Italian and German elements are mixed. At his death the Cesarini acquired the building which was modified in the XIXth century. 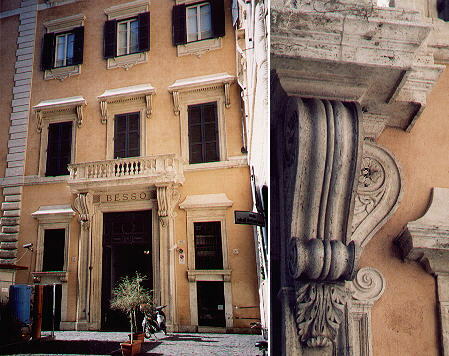 Today it hosts a small museum and a library on the history of theatre in Italy. Chiesa delle Stimate di s. Francesco Era quivi un'antica chiesa dedicata ai XL. ss. Martiri, la quale circa l'anno 1595. fu conceduta alla confraternita delle Stimate; e perchè era molto piccola e cadente, fu rinnovata con magnificenza secondo il disegno prima del Contini, e poi del Canevari. Fra gli altri quadri è molto rinomato quello della Flagellazione alla colonna dipinto dal Cav. Benesiani nella prima cappella a destra: il s. Francesco nell'altare maggiore è del Trevisani, quello nell'ultima di Giacinto Brandi, e le pitture nella volta sono di Luigi Garzi. Palazzo Cesarini, e chiesa di s. Niccolò Dalla nobilissima famiglia, che lo possiede, porta questo il nome, ed ancora lo da alla chiesa di s. Niccolò, che li sta in seno, anticamente detta delle calcare, come interpetrano alcuni delle calcare di calce, che ivi si facevano de' marmi del magnifico portico di Gneo Ottaviano console, che quivi era, ornato di colonne con capitelli di metallo. Fu questa conceduta ai Chierici Somaschi l'an. 1695. in ricompensa di quella, che avevano sul monte Citorio, demolita per la fabbrica della Curia Innocenziana. Incontro a questa fu eretto anni sono il collegio Calasanzio de' chierici Scolopj. Next step in your tour of Rione Sant'Eustachio: S. Andrea della Valle.